An excellent plug-in that's let down by some schoolboy design errors. Excellent sound. Great MIDI mapping. Lovely distortion. Highly versatile. Unclear colour scheme. Annoying clicks. Signal attenuation. The clear, intuitive layout is a big plus. The range of tweakable options is impressive. The sound of most plug-ins coming onto the market today is excellent, but usually no better than the rest. Instead, innovations are being made in the areas of interface design and routing. 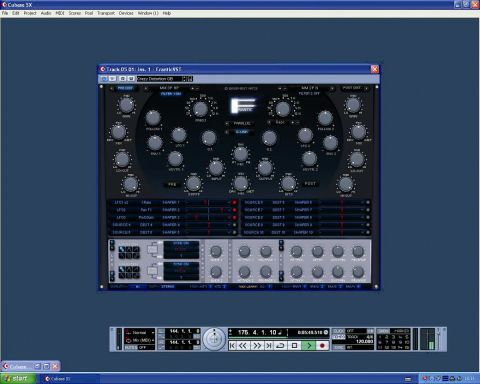 However, Frantic - a fully featured virtual filter bank - has a sound that genuinely stands out. Frantic contains two filter banks that operate either together, in series or in parallel. There are around 40 filter types onboard, ranging from the bread-and-butter to the exotic escargot. Most sound excellent. Thankfully, the industry has stopped trying to convince itself that virtual emulations sound truly analogue, so we can describe the sound as distinctly digital without it being taken as an insult. Frantic might not have the warmth of analogue, but it has a refreshingly smooth clarity, and even the higher resonance settings are free from the harshness that zeros and ones can bring. The first clue to this plug's ingenuity is the inclusion of a pre-filter distortion unit, which comes complete with high and low cut filters. And, boy, does it sound nice. The order in which effects are applied has a big impact on the overall sound of any production and a little bit of distortion at the start is never a bad thing. The next standout section is the modulation matrix. One of 75 destinations can be controlled by one of 50 sources in the ten routing slots, each of which can be shaped in turn by a second modulator. Sources include MIDI, onboard envelopes, LFOs and all manner of other goodies. As great as Frantic is, it's let down by a few niggles. Firstly, there's an unfortunate audible click if you turn a filter section on or off while it's processing a signal. Secondly, the GUI is very hard to see - small blue script on a black background is eyestrain just waiting to happen. Finally, when in use, the plug-in attenuates the signal significantly, so if you use an automation bypass command mid-track (which you must, since the plug-in's on/off switches cause clicks), the volume rockets up. We hope Basement Arts fix these issues as they're enough for us to lower the score of an otherwise excellent plug-in. If such a fix appears, then consider Frantic to be officially upgraded to 'must-have' status.